We strongly believe too much of a good thing is great! 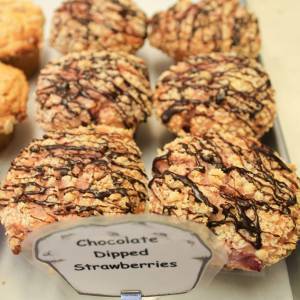 That’s why we, now listen… that’s why we dipped, I said dipped our strawberries in CHOCOLATE! We revel in the delight of dessert. We bake under the spell of muffin madness. And we do it all for you! This chocolate was hand collected in the South-American jungle, hand dipped on the moon (where gravity allows more chocolate to stay on the strawberries), and baked on earth.